JNN 29 Aug 2014 TEHRAN – President of the Iraqi Kurdistan Region Masoud Barzani has said that once again Iran proved that it supports Iraq in “tough situation” without any expectation. As Iran was the first One to respond to the call of Kurds to Provide them Arms to enable them to fight with the ISIL Terrorists. 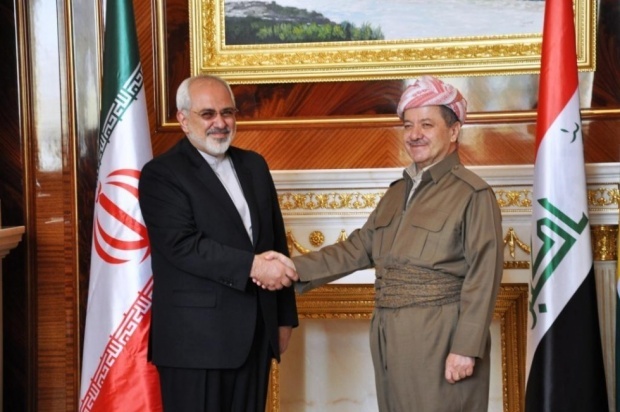 Barzani made the remarks during a meeting with Iranian Foreign Minister Mohammad Javad Zarif in Erbil on Tuesday. He also praised Iran for supporting Iraq’s national unity and territorial integrity. For his part, Zarif said Iran backs any agreement between the Iraqi central government and the Kurdistan Region. He stated that the entire Iraq faces one enemy which is terrorism and all Iraqis should get united to “eradicate” it. “Iran considers Iraq’s territorial integrity and stability as its own stability and security,” Zarif said. He said Iran has no military force in Iraq but is ready to help Iraq and the Kurdistan Region. The Iranian chief diplomat went on to say that threats posed by terrorism and extremism in Iraq are not restricted to one country or ethnic group, rather they are a danger to the entire world. Iraq is in a very complicated security situation as it is caught in a fierce fight with the Islamic State of Iraq and the Levant (ISIL) whose terrorists are crueler than any other terrorist organization the world has ever seen. The foreign minister said that Iran will stand by the Iraqi people in their fight against terrorism. Zarif reiterated Tehran’s position that the Islamic Republic supports the new Iraqi Prime Minister, Haider al-Abadi. Barzani expressed hope that the cooperation between Iran and Iraq would lead to eradication of ISIL. He went on to say that the Kurdistan Region has asked Iran for arms to lessen the ISIL’s threat. The Iranian foreign minister started tour of Iraq on Sunday where he held talks in Baghdad with some Iraqi officials including Prime Minister al-Abadi, former Prime Minister Nouri al-Maliki, Parliament Speaker Salim al-Jabouri, Foreign Minister Hoshyar Zebari, President Fuad Masum and Islamic Supreme Council of Iraq chief Ammar al-Hakim. “We are on the side of our Iraqi brothers from all sects, Kurdish, Sunnis and Shiite who are fighting terrorism, but we do not believe that they need the presence of Iranian soldiers in order to do this task,” Zarif said at a joint press conference with his Iraqi counterpart Hoshyar Zebari in the Iraqi capital of Baghdad. He also held meeting with Grand Ayatollah Ali al-Sistani in Najaf on Monday. Zarif discussed developments in Iraq and threats posed to the region with the grand ayatollah, the Iranian Foreign Ministry media department reported. On Monday, Zarif also met with other religious authorities in Najaf. Talking to reporters after the meeting, Zarif said Tehran attaches great importance to security, national unity and territorial integrity in Iraq. The chief Iranian diplomat also called for a speedy formation of inclusive government in Iraq. This entry was posted in Iran News, Iraq News, Middle East and tagged Barzani, iran, Iraqi Kurdistan, President. Bookmark the permalink.